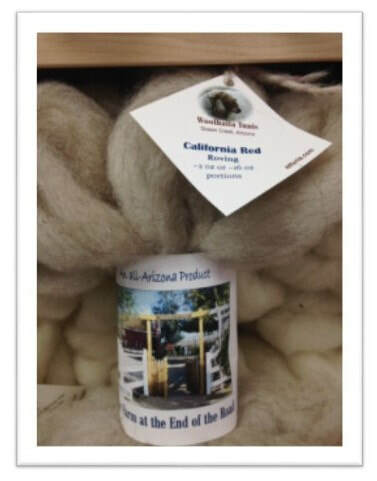 Woolhalla Tunis provides you with quality Tunis, CVM, and California Red fleeces from sheep that were some of the first of their breeds in Arizona. There are literally dozens of folks in Arizona and southern Utah who for one reason or another, keep between one and 10 sheep of various breeds, just as we do at the Farm at the End of the Road. Many consider the fiber to be a liability, feeling that shearing and caring for a single fleece or two is more trouble than it’s worth, and so the sheep might be uncared for or the fiber discarded. By networking with owners, shearers, and local fiber milling, we have developed access to a wide variety of fleeces and fibers, far beyond what our small hobby farm could offer. We decided if we could see the sheep sheared and return home in one day, that fleece qualified as “locally grown,” notwithstanding the week-long trip to Cunnington Farms in Moab, Utah for continuing education and the shearing of 60 to 70 sheep, as well as other fiber animals. Fiber labeled Woolhalla Tunis is grown by our own sheep, and fiber labeled Farm at the End of the Road is otherwise locally sourced. The very best and most pristine fiber of both lines is sorted out for sale to folks interested in working with “grease wool” or raw wool. In addition, this last six years has taught us the importance of being part of an urban farming and fiber community knowing that someone else is there to answer questions and offer skills so that every individual doesn’t have to do every single thing. We have created close ties with Cunnington Farms, Schafwolle Ranch, Sand Creek Farm, Ginger Farm, Half Pint Farm, and Cinnamon Roost Farm all of us supporting each other with breeding stock and other farm needs. For dyed fiber products we partner with ﻿Sonoran Desert Dyed Fiber ﻿for soft plant-dyed colors and Dyelicious for rock-'em, sock-'em acid dyes. At age 60+, we don’t want to learn to wrangle and shear sheep, so Mick Hoffman shears for us. In fact, shearing day has turned into a community event, with lots of neighbor input and help. We end with a pot luck meal and general recap of the day's thrills and spills. While skirting and sorting fiber can be a soothing process, hand processing much more than a single fleece is pretty intimidating, and so we rely on regional mills to convert fleece into roving and yarn. The rotating gallery to the right shows the many steps involved. Some of our wool on the shelves of Tempe Yarn and Fiber. 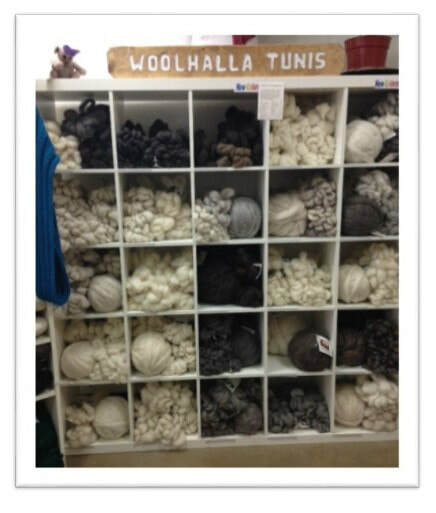 Together Tempe Yarn and Fiber and Woolhalla Tunis host special events. 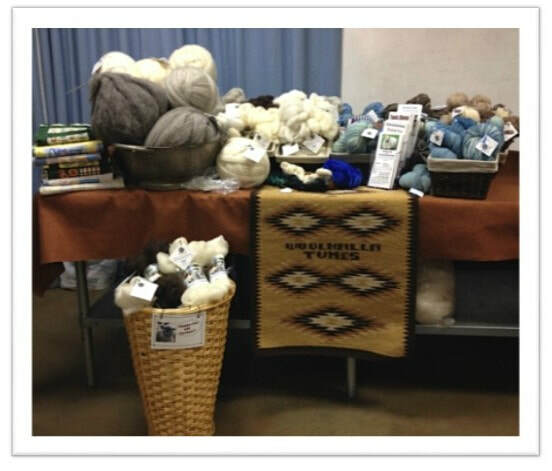 Wool School is a hands-on and discussion group that meets once a month for five months to learn about various breeds of sheep and best uses for their wool. Students create a project that is showcased at our Wool Affair, which is held shortly after shearing in March. Here the public can see fleece hand-processed from beginning to end and participate in the steps that interest them. Lots of hands-on and time for questions. And there is an annual festival in December that showcases local artists. Sample products from Woolhalla and the Farm. Do you want to spin wool from the breed Thomas Jefferson liked better than his Merinos, and was kept by him on the White House lawn? Tunis wool is favored by hand spinners for its varied shades of cream, ivory, and off-white, as well as its lustrous, bouncy 24-30 micron diameter fiber. Ewes shear a fleece weighing around 6 pounds, a portion of which is removed by skirting. The wool’s Bradford count is 56-58, and the staple length is 3-4 inches.